Lim (centre) and his entourage in a photo call with recipients at KMC Flats. 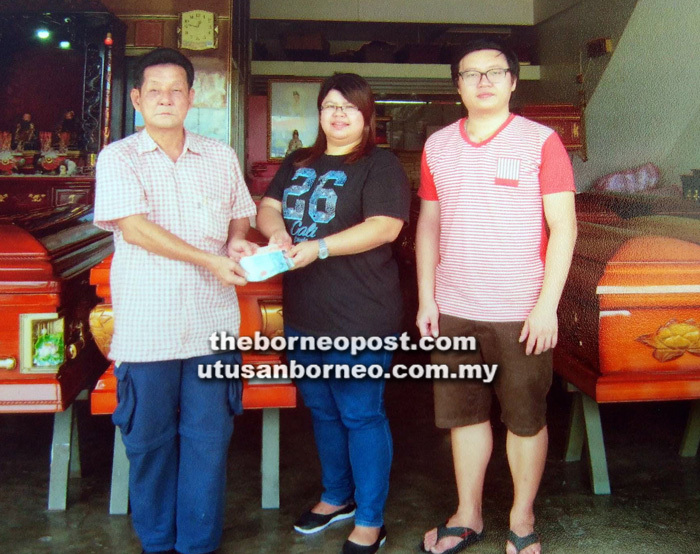 Lim (left) hands over a cash donation to a coffin shop representative identified only as Madam Sim. 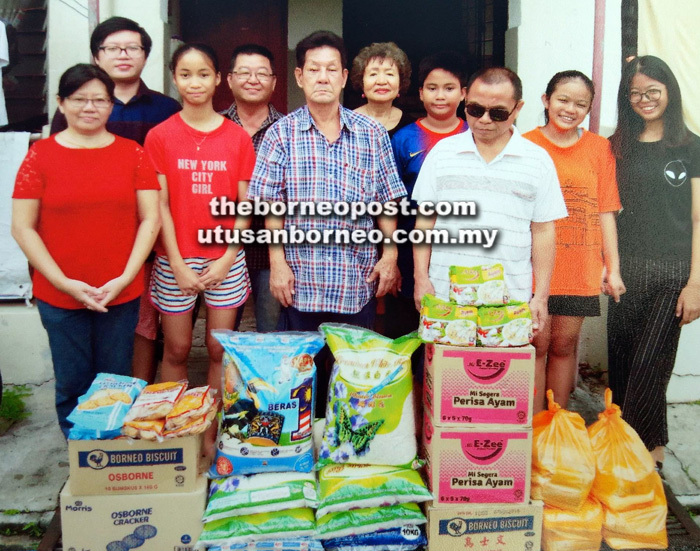 KUCHING: Four urban families at KMC Flats in Padungan here recently received food donations from a group of Good Samaritans brought together by volunteer social worker Lim Chee Haw. According to Lim, it was the third time this year they have reached out to these families following requests to assist them to reduce their financial burden. One of the recipients was blind woman Seri Pioh, who together with her also blind husband live with two young grandchildren. Both of them depend mostly on their RM600 monthly welfare assistance. Florence Sini is the other recipient, who together with her van driver husband, are trying hard to make ends meet to support their four school-going children with their low monthly income. Lim said the other two recipients are wheelchair user Lim Han Seng, who is suffering complications from diabetes and can no longer earn an income, and Susie Liching whose husband is a daily paid construction worker who earns barely enough to support their family of two small children. “I have lived in poverty and hardship during my younger years and I understand their predicament. These contributions, though not much, mean a lot to the families,” said the retired Marine Police personnel now devoted to charity work. He thanked a Mr Law and family from Foochow Road No 2, Fook Lai Construction in MJC Batu Kawa, a Mr Hii and Sandi Bunya from Jalan Matang, and others for their assistance in this latest charity act. On another matter, Lim said he recently handed over cash donations received from a group of Good Samaritans to a coffin shop here for the purpose of buying coffins for poor families in times of bereavement. He said poor families needing coffins for the funeral of a departed family member can contact him at 082-248153 or 016-8070388 for assistance. “Several coffins have been sent to poor families as far as Bau, Serian and Sri Aman. I thank the Good Samaritans who have donated money for this purpose, and their money is ‘parked’ at a coffin shop here to be used whenever we receive a genuine request for a coffin. “The donors may have done this out of an old Chinese belief that this could reverse their bad fortune, such as to revive or boost their business. Nonetheless, buying coffins for others is also a commendable act especially in the charity and welfare aspect,” said Lim. He added families assisted so far included one at Kampung Sadir in Puncak Borneo, Sungai Apong in Kuching, Kampung Murud Plaman near Serian, Kampung Sinjog, Mile 18 Kuching — Serian Road, Kampung Sabang in Simunjan, Kampung Tanah Merah, Mile 27 Kuching — Serian Road and Kampung Mantung Marau in Serian.